Shreve Stockton left the city to raise a coyote, partner with a cowboy, and launch a pastured beef business in Wyoming. Nine years ago, writer and photographer Shreve Stockton stumbled into a role as an internet sensation when she adopted an orphaned baby coyote named Charlie. She started an immensely popular photo blog called the Daily Coyote, which tracked Charlie’s growth as he bonded with Stockton and the other animals in their lives. The blog eventually led to a book deal. Stockton had landed in Wyoming after taking a solo Vespa ride across the United States in 2006 with the intention of moving from San Francisco to New York. The state cast a spell on her, and upon her arrival in New York, Stockton did a quick turnabout and moved right back to the mountains and prairies. There, she fell in love with a cowboy named Mike (who prefers to go by his first name only), who brought Charlie home one day. 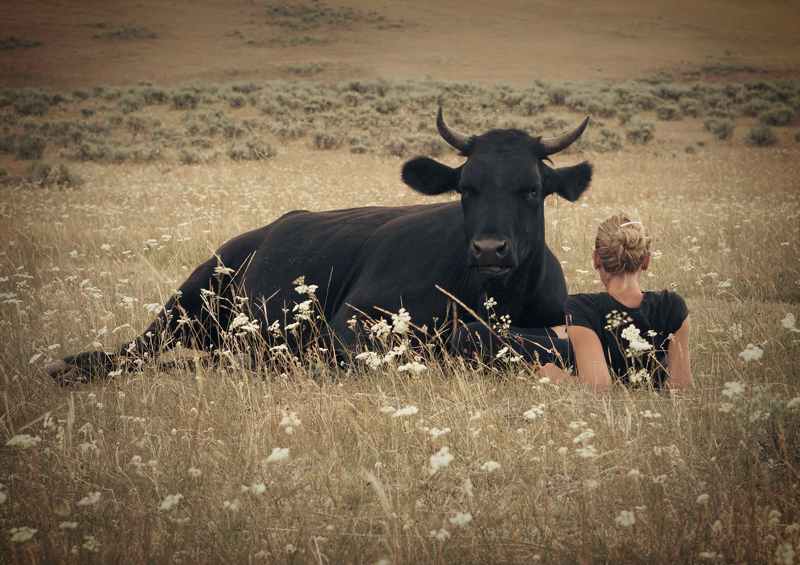 Thanks to her book advance, Stockton soon began buying Black Angus calves from Mike, a rancher, in order to save them from the feedlot and rear them herself on grass pastures. “It was devastating each year when he had to sell his cattle into the feedlot system,” Stockton recalls. Stockton has been building a humanely raised beef business, Star Brand Beef, since 2010. Now she has launched a website to take orders from customers around the nation. Stockton’s animals are harvested once a year and the meat is delivered in August—on a tour that goes from California to Minnesota. “Customers meet the delivery truck at a central location during a 1- to 3-hour window to pick up their beef,” reads the Star Brand site. Stockton recently scaled up her business by joining forces with two other ranchers, whose beef and lamb she sells on tour with her own beef. Altogether, they’re working with fewer than 100 cattle. In addition to raising the animals, Stockton is also responsible for all of the logistics and delivery. With the help of a Kickstarter campaign, she has raised funds for an independent Star Brand Beef refrigerated trailer, which will help her to extend the delivery route and bring on more ranchers. “Having my own trailer will allow greater flexibility for my customers and for me and will eliminate the massive stress associated with renting reefer trucks from Montana and Colorado,” she wrote on her Kickstarter page. The blogger-turned-rancher aims to create a low-stress environment for the cattle she raises every year, beginning with the practice of humane weaning. She also avoids practices like using electric cattle prods or culling animals who can no longer reproduce. In summer, the cattle are taken up to a 1,000 acre pasture on a mountain “untouched by civilization.” When fall comes, the animals trail down the mountain and graze on fall pasture; during the winter months they are fed hay every day. Stockton is currently foregoing U.S. Department of Agriculture (USDA) organic certification. “We lease pasture and buy hay,” Stockton explains. “To be organically certified, the farmers who farm the hay would have to be organically certified. And the ranchers we lease land from would have to go through organic certification.” Both are prohibitively expensive, she says. And she’s not alone. According to the USDA, there are only 73 certified organic operations in Wyoming (compared to 4,400 in California and 1,000 in New York, Wisconsin, and Washington). Many ranchers are seeking out more affordable alternatives to the organic label. Certified Naturally Grown, which offers peer-reviewed certification to farmers, saw a 20 percent increase in applications in 2015. Stockton also feels that the organic label is limiting when it comes to telling customers how well the animals are truly raised. Although the USDA recently announced a plan to beef up its animal welfare standards, the existing rules have left much of the animal welfare decisions up to the individual rancher. Despite the popularity of both the Daily Coyote and the “farmily” blog Honey Rock Dawn, not all of Stockton’s animal-loving online fans have embraced her approach to keeping cattle out of feedlots. She has lost readers and has even received hate mail, since she began running Star Brand Beef. Despite all this, Stockton sees the internet as a powerful tool that can help people with a variety of personal approaches to eating find a common middle ground. “It would be great if we all could focus on the part of the Venn diagram where we are similar, rather than the parts where we are different—and cooperate from there,” she says. Photos courtesy of Shreve Stockton. Just because an animal is destined to be processed into food to sustain us does not mean we have to be cruel. No need for torture or a miserable life. What is wrong with making sure that animal has the best life possible for the life they have? It's healthier for the animal and healthier for us. What we need to do is stop eating unhealthy beef from animals that will die of liver failure by the time they are two years old due to their unnatural diet and horrid living conditions. That and eating much less beef. There is no need to eat large amounts of meat every day of the week or at every meal. Not sure what the coyote really has to do with it. Will also point out the USDA Wildlife "Services' kill 76,000 coyotes every year, largely to protect cattle. And what they kill is likely just the tip of the iceberg. Ranchers probably kill a lot too.